Hattie H won the Girls Singles U13 Gold, Georgia E won the Plate U13 Gold and the two won the U13 Gold Girls Doubles. Long day but well done girls. Another fabulous set of trophies for Hereford. 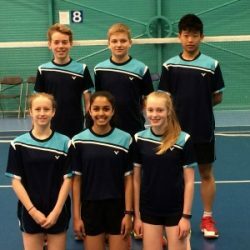 Great afternoon of friendly competition between local Hereford Cathedral School Badminton club and The Hereford Academy…always good to host new faces on our Sunday afternoon sessions. 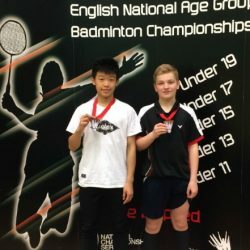 Chad W won a Bronze medal at the u15 National Championships in the Doubles competition losing out in a high quality semi-final against an England pair. Chad is pictured with his partner, Stephen J from Shropshire. Congratulations! 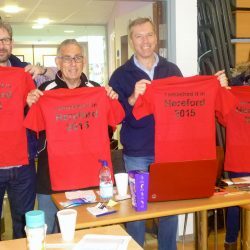 Our Club AGM is being held on Saturday 1 September 2018, at 09:00. It will be at the Cathedral School, to coincide with the last day of the Summer Camp. All HBA members are welcome to attend and we welcome your involvement and ideas on how to develop and expand the Club. We did it again today!! 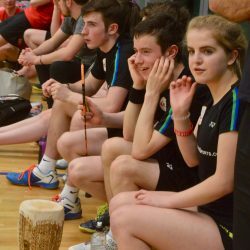 “The best junior tournament in the calendar - well organised fun and supportive” WELLDONE to the organising team. 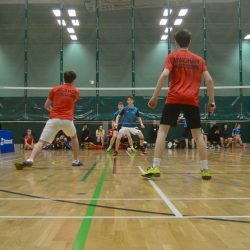 Come to our last one of the season- U17 Herefordshire Bronze - closes Monday - ENTER!!!! !